Written by Dirtbag Runner Michelle Evans. We awoke frigid and sore from shivering all night. The full moon shone brightly, flooding the campsite in a pool of light and we couldn’t be more thankful. We needed it to pack up our camping gear at the quiet hour of 4:30am and didn’t want to leave anything behind. With the car loaded and our thermos full of coffee, Bobby and I piled in and began the six hour drive from Bryce Canyon, Utah to Chinle, Arizona. Along the journey the sun began to hint at rising for what seemed like an eternity. The sky was lit with a deep emerald hue that provided a stunning backdrop for mesas and hoodoos in the arid desert. 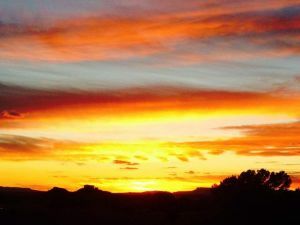 I have always preferred sunrises to sunsets, especially in the Southwest. We entered Navajo country and were stunned with the vistas, but even more-so the people. Every encounter we had with the locals was filled with genuine warmth and welcoming smiles. 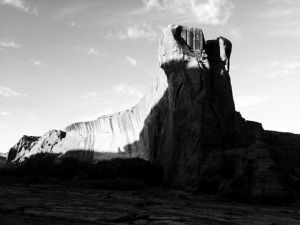 We pulled up to the visitor’s center for Canyon de Chelly, where our race would be held, and marveled at the photography exhibit before heading to the campground for check-in and race briefing. We arrived to the campground and scoped out a spot in the very back, next to a large field with a hillside view and, most importantly, two trees perfectly spaced for setting up our hammock. After setting up our makeshift home, we walked over to the amphitheater to check in and spotted familiar faces wearing familiar adventure-sandals (www.lunasandals.com) and were greeted with mile-wide grins from race director Shaun Martin and his wife Melissa. 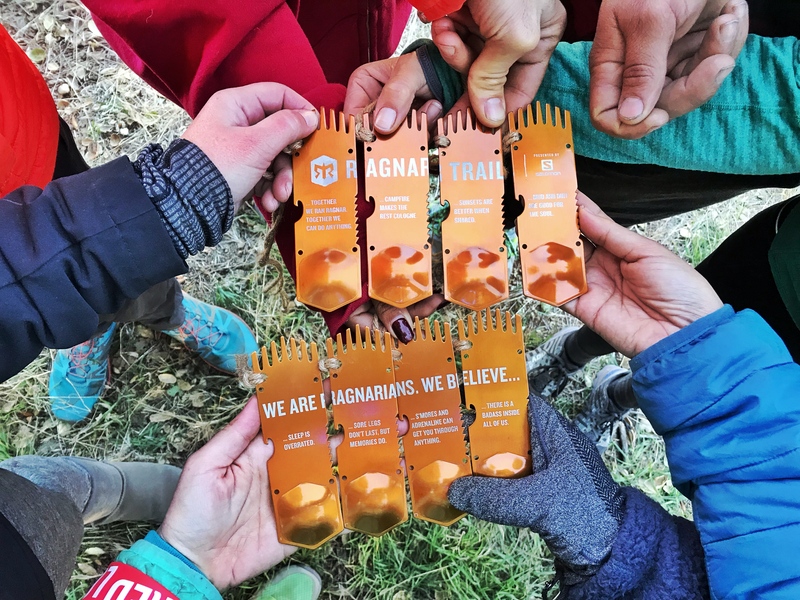 We marveled at the handmade finishers awards that included handmade turquoise necklaces that would adorn each finisher. These were painstakingly crafted by Shaun’s grandmother, with help from his own young children. 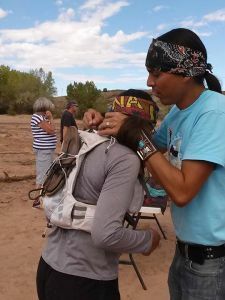 For the speedy, overall awards included beautiful traditional Navajo necklaces, Pendleton blankets, custom tapestries, moccasins, and a handmade ceramic cooking pot. Incredibly detailed bracelets created by Shaun himself awaited the age-group winners. While we gazed amongst the awards, tourists continued to stop by and ask for the prices. You couldn’t purchase these, we explained, you could only win them through grit and hard work, by running 34 miles in beauty. As the sun set a fire was lit and the runners gathered to take part in the briefing. Shaun told us of the good that this race does, expanding far beyond our own expectations, to the local community. 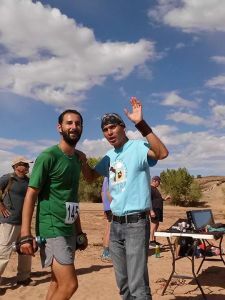 It was the Chinle youth that benefitted most (besides the deep spiritual experience that the Canyon provides to the runners), with the money raised going towards cross-country events, clothing, shoes, and more importantly the lasting impact of the energy that trail runners give off. We were there not only to run a race and raise funds, but to set an example of how running can positively change lives. Shaun’s father-in-law, William Yazzie, explained to us how encouraging the youth to run can help to steer them away from the everyday pressures of negative influences that may otherwise be imposed upon them. Running makes us strong. Running helps to give us purpose. Running saves lives. He then graced us with song and a Navajo prayer. We parted ways, heading to our individual camps full of inspiration. Our alarm went off at 5:30am. From outside our tent we could hear the rustle of life from our neighbors. In the next site over, Jim had gotten a small campfire going. This created shadows that played along the trees as runners prepared for their journeys into the Canyon. The temperature was perfect, which meant that there was a strong potential for the day to warm early. We brewed coffee, ate an avocado, and reveled in the peace of the morning air. With 20 minutes until the sunrise, I laced up my sandals and we took off for the starting line. The start of a race is historically chaotic, full of franticly anxious racers, drop-bag worries, and long porta-potty lines. 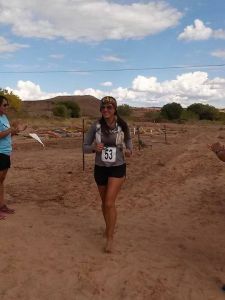 Not at the Canyon de Chelly Ultramarathon. Only whispers could be heard, as we stood in silence waiting for the sun to rise, signaling a new day. A fire was lit, and would burn until the last runner crossed the finish line some twelve hours later. Shaun’s father blessed us using the smoke from cedar placed in the fire, lifted up by white eagle feathers that had been passed down to him from his father, and his father before him. As the sun hit the canyon wall we let out a call, announcing our presence to the Canyon as well as our good intent to enter. The website describes the first 2.5 miles as being soft sand. I would like to wager that the first five miles (and therefore last five miles as well, being an out-and-back) is in fact soft sand, but I suppose it’s better to not know what lies ahead of you sometimes. As we ran the Canyon was blanketed in deep reds and purples as sunlight painted the steep walls. We were encouraged to let out a yell when we felt that special something that the Canyon stirs deep within us. For the entirety of the race, calls of runners and locals currently residing in the Canyon, as well as those watching down on us from the rim above, bounced along the walls to our delight. Echoes of the runners’ calls bounced off the Canyon walls. Bobby and I felt strong as we ran the 17 miles to the turnaround point at the end of the Canyon. 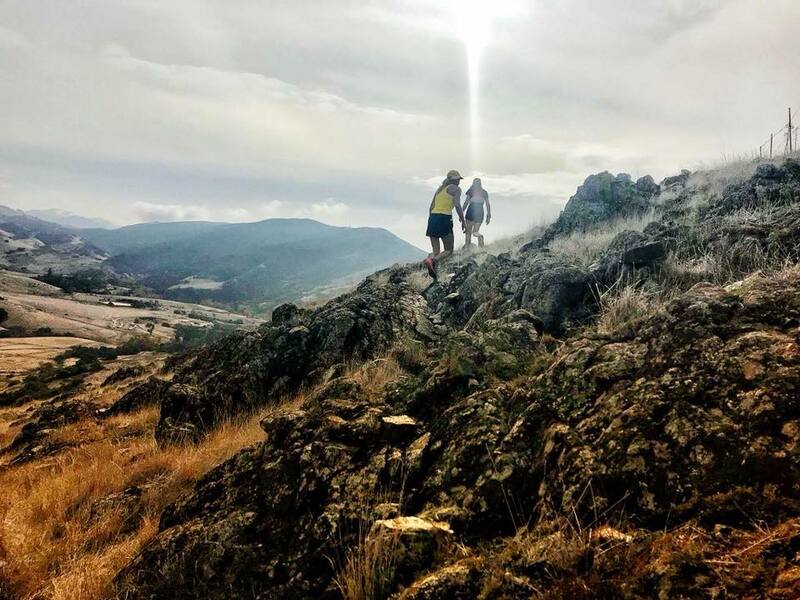 We ran past the thousand year old ruins of the 80-room White House, petroglyphs, and caves. We laid our eyes upon humbling Spider Rock, two free-standing pinnacles that tower 800 feet over your head. After about fifteen miles or so we turned out of the wash that cuts through the Canyon and up a steep single-track trail that climbed to the rim. Using our hands, we scrambled along the boulders to a breathtaking view of the Canyon that we just ran through. It was such a rewarding vista that we took our time at the aid station. We chatted with our fellow runners and the volunteers while we ate melons that had been grown locally and harvested just for this event. We bid our farewells and picked our way back down the rocks. The rewarding view at mile 17. Up to this point we had agreed to run together down into the canyon and, depending on how we were feeling, run at our own pace on the way back. I was feeling a little stronger than Bobby, so I picked up the pace and we began our separate journeys, alone but together on the Canyon floor. I let out a yell and began reeling runners in one at a time. With each step I could feel the energy in my legs ignite. I heard a hawk call nearby and I imagined I could fly. Before the start of the race Shaun encouraged us to listen to the sounds of the Canyon and let them inspire you. As I pretended to fly, I heard the wind whistle through the cracks and crevices. In the distance I spotted a familiar head of long black hair. It was Maria! With my sights fixed on her strands playing in the wind, I quickened my steps to catch up. 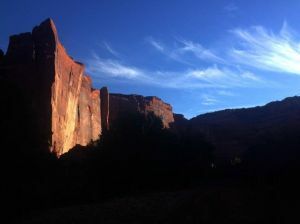 We chatted briefly about the beauty that is Canyon de Chelly and what a truly amazing experience we were having. Maria was moving at a quick pace and feeling great. At mile 28 we reached the last aid station. I ate more melon and refilled my pack with water, ready for the last five, sandy, sun-exposed miles. I had been particularly looking forward to this moment from the start of the race. I quickly untied my sandals and strapped them to my pack. 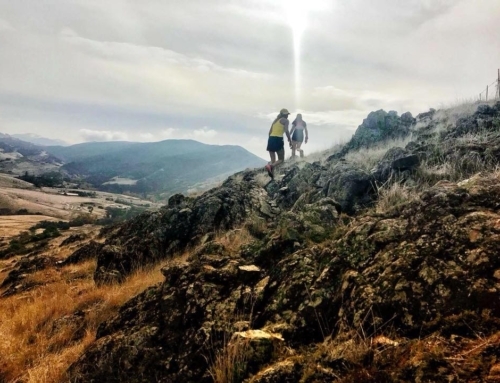 I felt the cool, gentle Earth under my feet and every part of my body that had been tiring suddenly felt rejuvenated, as if I hadn’t already ran more than a marathon. I took off swiftly, alone again. I found a good rhythm as I made my way through the soft, deep sand. At home in California I run in the sand multiple days out of the week, so I was feeling comfortable with the terrain. 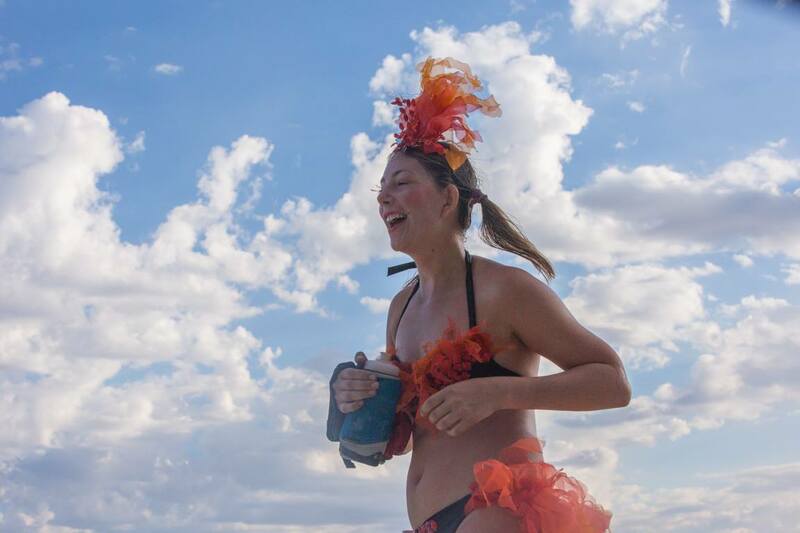 At a lively pace, I began passing more and more of my fellow runners as they trudged along, having difficulties lifting their feet fast enough not to sink. The Canyon walls began to widen and the sky opened up. At one point I stopped seeing the flags that guided us along the course. A playful Native family on horseback called to me and told me I was going the hard way, that the path with the flags was just up to the right. I thanked them profusely and found my way back to the course. For the next three miles they rode alongside me, racing their young son along the river bottom, but thoughtfully only getting up to a trot so as to not stir up dust. The young boy would occasionally let out a call out of pure excitement from the ride as they spoke both in Navajo and English to each other. I listened to them joke with each other and laugh, they were clearly having a great time. I smiled, using their positive energy to help me on my way. The finish line was just ahead and I could hear the excitement of runners who had just experienced something really special echo down into the Canyon. I finished the 34-mile race unaware of how long it took me (I rarely wear a watch) and to be honest, I didn’t really care to know. I was ecstatic. I had run in beauty, and, like the hawk, had felt my spirit soar through each mile. Finishing with high spirits. Photo credit: Rina Tapia, thank you. Bobby finished not too long after me, and you could see in his eyes that he had had a similar experience. Salt caked his forehead and there was fire in his eyes. We sat in the sand, eating stew and frybread, and watched our friends finish. After the awards were handed out, we gathered around the fire just as the sun was beginning to set. We thanked the Canyon, and Shaun’s father cooled down the last runner to cross the finish line with water, to represent healing for every runner. The fire was then put to rest in the Earth, but bled to the Sky, creating the most remarkably vibrant sunset I have yet to lay eyes upon. It could not have been a better ending to such a powerfully meaningful day. A sincere thank you to Shaun and his family, and to the Canyon. This brought tears to my eyes. Beautifully written and what an experience this must have been. Although pictures may say 1000 words….I don’t think there will ever be enough pictures to capture your experience. Thank you so much Michelle. Thank you Ilja! It was difficult to express in words what an experience it was. 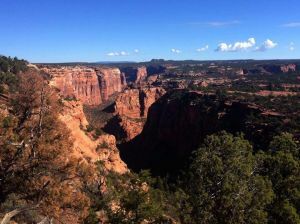 Hope you can make it out to the Canyon de Chelly Ultramarathon 2015! Happy trails….